It is against California Department of Fish and Game regulations for private citizens to plant mosquitofish in waters of the state without a permit. The District provides FREE mosquitofish to all District residents for placement on their property only. Please call the District Headquarters at (562) 944-9656 or the Sylmar Branch at (818) 364-9589 to request FREE mosquitofish for your home. These fish are routinely stocked by Vector Control Specialists to control mosquito populations in sources such as artificial lakes, irrigation ditches, and industrial ponds. By law, Vector Control Specialists can place fish in water sources other than those located on private property. To avoid competition with sensitive native amphibians and fish species, we do not stock mosquitofish in habitats where such species are known to be present. 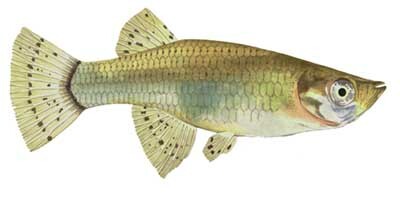 Mosquitofish (Gambusia affinis) were first introduced to California in 1922 for mosquito control. Instead of using insecticides to control mosquitoes, fish are an attractive and effective alternative. This method is referred to as biological control and is part of the Integrated Vector Management Program at the District. Small, which enables them to inhabit shallow waters and penetrate dense vegetation growth where larvae and pupae hide. Broad tolerance to a wide range of environmental conditions, such as temperature changes, salinity, organic pollution, and poor food supply. Both sexes have a pale grey body, fading to muddy white on the belly. The dorsal and rounded caudal fin may exhibit dotted banding. When you get your fish home, acclimate them to their new site. Place the container with the fish directly into the water for 20-60 minutes or until the pond’s water and the container’s water are nearly the same temperature. Then release the fish. Mosquitofish can tolerate 33-104° F. water temperatures, but prefer 77-86° F.
Copper pipe or fittings in contact with the water can kill the fish. The pipes can be coated with a special paint available at hardware stores. Plastic piping is preferable. New concrete ponds will leach lime into water and make the water alkaline. A new pond should be appropriately season (filled, allowed to stand several days, drained, and refilled). The pH of the water is best in the range of 6.5 to 8.0. An inexpensive pH kit can be purchased at a pet or swimming pool supply store. Wine or whiskey barrels will leach harmful chemicals into the water at first. They should be soaked and flushed out several times or lined before adding fish or plants. Mosquitofish are omnivorous and have a voracious appetite for mosquitoes. A large female can consume hundreds of larvae per day. All sizes and ages of mosquitofish feed on mosquito larvae. They also eat algae and small invertebrates. Mosquitofish seldom need supplementary food, but during the winter larvae may be scarce. In this case, tropical fish flakes are suitable, as well as dry dog or cat food. Overfed fish may not eat mosquito larvae and excess food may cause bacterial bloom, toxic to the fish. During the winter, the fish hibernate in the lower water depths, and reappear in late spring when water temperature becomes warmer. The fish prefer sunlit areas of the pond and do not thrive in a heavily shaded pond. Provide large rocks and vegetation for shelter from predators such as raccoons, opossums, and egrets. Small amounts are a good food source for the fish, but if it gets too thick the fish might be unable to get to the mosquito larvae. Some algaecides are toxic to fish, so they should be used only if recommended by a knowledgeable aquaculturist. Materials and instructions may be obtained from local tropical fish shops and garden supply centers. Certain leaves, like pine, oak, and eucalyptus contain chemicals that are harmful to fish. Accumulation of these leaves makes the fish too sick to eat mosquito larvae. Make sure to remove these leaves from your water source.